Frozen sausages, burgers, bacon, cakes, scones, and eggs available on site. Local meats and food available for pre-order. Dogs are welcome with feed bowls, dog bed & homemade dog treat. From the A9 South come off at the Pitlochry junction; come into Pitlochry centre and past Fishers Hotel on the left. Follow signs for Breamar and Kirkmichael (right turn after Davidsons Chemist). From the A93 South pass through Blairgowrie following A93; cross the river and turn left following Braemar signpost. 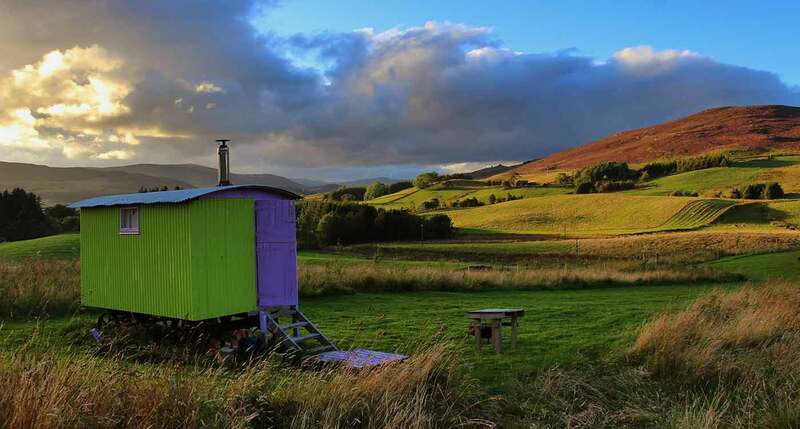 Eco Camp Glenshee is a year-round glamping site set amidst the stunning backdrop of the Southern Cairngorms at the edge of Cairngorm National Park. Amidst the 10 acres of wildflower meadow are six lit and heated pods, two Shepherds Huts (Shieling Mohr sleeping four and Peerie Shieling sleeping two) and finally a huge 10-person yurt. Bell tent is situated overlooking the stunning panorama of Glenshee, with Mount Blair to the right and Schiellion to the left. Your bed comes complete with a memory foam mattress and 100% cotton bed linen. Two relaxing chairs and a table with retro china ensure you enjoy your stay. Outside, you have your own BBQ/fire pit with extra chairs and our own recycled table. All wood is provided free of charge. Romantic Pod: You have stunning views out over Glenshee with your own Munro Schiehallion in the distance! Your pod has its own double bed with memory foam mattress with crisp white cotton sheets and handmade quilt. You have your own fair trade tea, coffee and hot chocolate with kettle, plus vintage china. We will even deliver breakfast to your pod! Wood Pod: Think of your Pod as a warm, secure tent. We provide five comfy beds with fleece blankets and all you need to provide are your own sleeping bags. The Pods are well heated, thoroughly insulated and have lighting. Shepards Huts for 4: This is a refurbished, llama themed traditional hut with cosy wood burner. The double bed is supplied with a double sleeping bag and liner and two single beds with pillows, and we can supply sleeping bags at a small cost. Family Yurt: This yurt has a raised double camp bed (Mum and dad! ), Turkmeni decorations, stove, pots, pans, crockery and cutlery. Sleeping bags—bring your own or we provide. It also includes eco fairy lights, lanterns and candles provided. Romantic Yurt: Perfect for sleeping two people with a cozy, romantic interior and a perfect setting for privacy and scenery. Double bed, crisp white sheets, Turkmeni décor, wood-burning stove, candles and lanterns. Pots, pans, crockery, cutlery, table and chairs and fairy lights are also included. Monster Yurt: Check out our monster yurt. It's well equipped for all seasons with a snug felt interior liner (in winter) plus stove and oven. In summer, we have a huge fire pit, perfect for BBQ-ing with outdoor seating. Our yurt is a complete getaway, complete with off-grid, candle-lit chandelier and wind up lanterns! The Yurt contains pretty much all you need: pots and pans, kettle, mugs, glasses, cutlery, cast iron pan for roasting and any thing else can be found in the Bothy, including electricity for charging phones, etc. Want to try something unique? You can try a Llama Trek here at the eco-camp—a true country experience. Animals abound at the Glenshee. The destination is prime farming land, and you will be a part of farm life. Cattle, black sheep and other farming animals are regular visitors here.